Today finding and keeping talent – even for recruiting experts – is trickier than ever. You’ve probably seen it in your own staffing and recruiting teams: you need recruiters with a much broader skillset than a decade ago. In this high-risk, high-energy profession, you need recruiters who are able to move fluidly from discipline to discipline, who are able to use digital tools with ease, and who exhibit the cultural competencies so in demand in the global workplace. And let’s face it: not everyone is cut out to be a recruiter. To keep your organization strong, you need to find people who are dynamic enough to attract top talent, personable to win their trust, and tenacious enough to follow through and close the deal. Finding a candidate with the right combination of skills to flourish in your organization for the long haul doesn’t have to be a matter of guesswork. Discover how a scientifically validated process for obtaining feedback about a candidate’s past performance can help you get the insights you need to make your next hire. 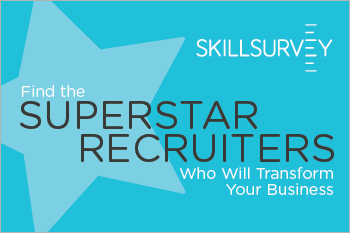 Download our whitepaper, Find the Superstar Recruiters Who Will Transform Your Business, to find out the secret to making great hires.